We’d love your help. Let us know what’s wrong with this preview of The Readers of Broken Wheel Recommend by Katarina Bivald. It’s also a book about This is a book about books. All sorts of books, from Little Women and Harry Potter to Jodi Picoult and Jane Austen, from to Stieg Larsson to Joyce Carol Oates to Proust. It’s about the joy and pleasure of books, about learning from and escaping into them, and possibly even hiding behind them. It’s about whether or not books are better than real life. To ask other readers questions about The Readers of Broken Wheel Recommend, please sign up. Books to read if you enjoyed the readers of broken wheel recommend? Jen immediately took a photo of Sara sitting in the window with her book. "Who the hell wants to watch someone reading?" Grace asked from the doorway of her diner. EXACTLY. Who the hell wants to read a book about someone reading books? You could spend the exact same time it takes to read this book on Bookstagram or GR and have the same result. It's all about how great books are and the glory of reading. Who wants to read 394 pages of that!? This book falls into the same category as The Storied Life Jen immediately took a photo of Sara sitting in the window with her book. This book falls into the same category as The Storied Life of A.J. Fikry, and that is NOT a compliment. This book is one of the most boring books I've ever had the displeasure reading. A boring book filled with boring people. Sara is a book nerd with no life. She comes from Sweden to Iowa because of her pen pal, only to find her pen pal has just died. She lives in the dead woman's house and opens up a book store. All the characters in this book are SO one-dimensional. In fact, for a "small town" full of "quirky characters," I was having a heck of a time being able to tell any of them apart, since Bivald is highly confused about what counts as creating a character. Listen, "the gay one," "the gay handsome one," "the fat one who smokes a lot" and "the depressed older black man" are NOT fully developed characters, instead they are thin, bland, watery standins for actual character development and storylines. And each of these characters - who should be radically different - are SO alike and SO undifferentiated that each time they appeared on page I was wracking my brain trying to remember who they were and what their alleged side-plot was. Utter fail on the part of Bivald, this couldn't be more bland and soupy. If Bivald had made this book a romance, I might have been entertained enough to give this more stars. She actually is a pretty competent romance writer. I'd be interested in seeing what she could accomplish in a romance novel. But instead she makes this book a sentimental, cutesy wootsy book about the love of books and about how reading cures everything and how readers are good people and how everyone should read. While I appreciate and understand what she's trying to do, this isn't a plot. The book is boring, the characters are so sadly underdeveloped that I couldn't even differentiate one from the other, and the 'plot' is random and often nonexistent. One last point: Bivald spoils plots. If you HAVE NOT read all the classics and all the bestsellers, you might want to tread carefully with and/or avoid this book. She helpfully provides a list in the back of all the books she "mentions" in the book, you might want to peruse that because there's a good chance she tells you the ending/key plot twists of these books. As someone who is pretty well-read but still has a lot of gaps in her reading, I was annoyed. READ AT YOUR OWN RISK. Tl;dr - No semblance of a plot. Thin, indistinguishable characters with no three-dimensionalism to them. A book about books, the love of reading, and how reading is the bestest thing ever! Many books spoiled without warning and for no reason. Mildly interesting, very slight romances that may have improved the book if they were more focused on. As it stands, SLIGHTLY better than The Storied Life of A.J. Fikry, which is damning with faint praise. You'd be better off spending five minutes on GR or bookstagram in place of this 394-page snoozefest. First, everyone is a ignorant, judgmental I'd-never-touch-a-book Iowan, then a Swedish lady comes and introduces people to their first books! And finds a perfect fit of a book for each of them! And it opens up their worlds! And makes them better people! Book magic! Worship books! This book should have come with the big note on its cover that says ''WARNING: SPOILERS INSIDE''. You see, this book is a book written by a book lover for other booklovers. And do you know what book lovers like to do? Talk about books. Discuss plot developmets. They often compare one story to another, wondering why the certain character chose one path over the other. Our main character, Sara, is a true bookworm, so it is no wonder that this book is full of references to other books which often ends This book should have come with the big note on its cover that says ''WARNING: SPOILERS INSIDE''. Our main character, Sara, is a true bookworm, so it is no wonder that this book is full of references to other books which often ends up spoilery. When I say she is a bookworm, I mean she reads, lives and BREATHES books. You see, only a true book lover would know the difference between the smell of paperback and the one of hardback book. The story follows Sara who came to a small town Broken Wheel, Iowa, to spend her summer with her pan pel friend who's a booklover herself. Things get complicated when Amy, the woman Sara should have stayed with, ends up being death. Town citizens decide it would only be fair for Sara to stay in Amy's house like she would have in the first place, because that is what Amy would have wanted. Days pass and Sara opens a little bookstore in which she sells books that once belonged to Amy. This book is originally written in Swedish and it is already a bestseller in many countries (Croatia included). Although I have read a copy translated into English, if I didn't know I was reading a translation, I wouldn't have guessed. That is how great the translation was. What I liked about this book the most was the atmosphere in it. I really like everything about The Broken Wheel, it's rezidents and their lifestyle. I couldn't help but think about Hart of Dixie the TV show. This book has everything you need in a book: it is fun, it has a great love story that takes time when it comes to love development, it has interesting side stories, diverse characters and important issues that were discussed in the story. After finishing this book I understand why this book is an international bookseller. It deserves all the hype that's around it. If you are a booklover, I am sure you will appreciate this story. I surely do. Note: I got this book for free via Netgalley in an exchange for an honest review. Thank you Sourcebooks Landmark. Although the premise seems a bit odd, stranger things have happened in real life so I just accepted that a young girl from Sweden would travel to a tiny town in Iowa , called Broken Wheel to stay with a woman that she only knew from exchanging letters and books . These letters, at least the ones from from Amy Harris of Broken Wheel to Sara , are interspersed throughout and we learn more about the town and the people who live there as well as about Amy and Sara. Sara loves books - how can I not l Although the premise seems a bit odd, stranger things have happened in real life so I just accepted that a young girl from Sweden would travel to a tiny town in Iowa , called Broken Wheel to stay with a woman that she only knew from exchanging letters and books . These letters, at least the ones from from Amy Harris of Broken Wheel to Sara , are interspersed throughout and we learn more about the town and the people who live there as well as about Amy and Sara. Sara loves books - how can I not like her ? I couldn't help but feel sorry for her as she arrived. Seems like she's a lonely girl hiding in her books without any friends except a few coworkers. It was a bit much for me , even as much as I love books , that there was discussion about whether one loved books more than people. It's a town of quirky characters concerned about how to entertain their tourist. The town is falling apart really . Some people had jobs and money and those who didn't were taken care of and paid back by helping fix things when needed. They all wanted to take care of Sara , paying for her food and drinks , driving her around. She decides she has to do something to pay them back and of course this involves books. It's light which is just what I was looking for , but it was a little chick lity , pretty contrived and the ending was definitely predictable. However, I'm giving it 3 stars because I grew to like some of the characters in this quirky little place, and though predictable, it was uplifting as Sara and the people in this town find a way to change each other's lives. What's better than books and a good love story? Let's see...oh yeah, nothing. Seriously, I'm a sucker when it comes to feel-good love stories, and if you've been following me or this blog for any length of time then you know full and well that books are my absolute weakness. Ever wonder whether I'm at a hopping party on a Friday night? Well don't because I'll go ahead and tell you - I'm curled up with my dog and a blanket on the couch with a good book. The Readers Of Broken Wheel Recommend was thi What's better than books and a good love story? Let's see...oh yeah, nothing. The Readers Of Broken Wheel Recommend was this week's big hit in terms of things that I read and I seriously cannot recommend it enough. Obviously a story written by a book lover for other book lovers, this author will definitely be going down as one of my favorite. The story is about a young girl, Sara, who arrives in the small town of Broken Wheel to visit a pen-pal that she has had for several years. But when she arrives and realizes that things are not going to play out quite as she and her friend had planned, she does what anyone would do. Start a book store, of course! Okay, so maybe not anyone would start a book store, but that's precisely what makes this book so charming. Not only does NO ONE in Broken Wheel seem to understand the pleasures of getting lost in a good book, but they can't for the life of the understand why she would want to actually get them to read in the first place. So between selling books and realizing that maybe love and the law can go hand in hand (you'll see - trust me. ), Sara learns about what's really important in life. As for how I personally came to read this book is pretty funny in itself. I was seeking out books to spotlight on this site and this came as a request. Not that I didn't have high hopes for The Readers Of Broken Wheel Recommend, but I have to tell you I was blown away by how much I ended up loving this story. It was truly one of those books that I wanted to read very slowly so that it could go on forever and yet I couldn't put it down. Very rarely do I feel like I come across a book where the characters feel so real. The people of Broken Wheel, however, could easily be my neighbors, my friends, those around me. They feel THAT real, and when that's the case it makes it so so easy to feel like you're just another inhabitant of this cozy little town where the story is taking place. If you're a lover of books, reading, or just charming stories of what life holds in terms of love - I cannot recommend this one enough. I know it's not summer yet, but if you're thinking of jetting off to the beach in order to make it through this winter, PLEASE make this the book you take with you. There's a lot to love in this novel of Sara, a young, rather plain Swedish bookworm who takes a trip to the small U.S. town of Broken Wheel to visit her older pen pal and fellow book lover, Amy. When Sara arrives, she finds that Amy has died while Sara was en route, but the townspeople urge her to stay in Amy's home anyway and visit with them for the couple of months she had planned. "Broken Wheel was a complete waste of brick, asphalt, and concrete There's a lot to love in this novel of Sara, a young, rather plain Swedish bookworm who takes a trip to the small U.S. town of Broken Wheel to visit her older pen pal and fellow book lover, Amy. When Sara arrives, she finds that Amy has died while Sara was en route, but the townspeople urge her to stay in Amy's home anyway and visit with them for the couple of months she had planned. 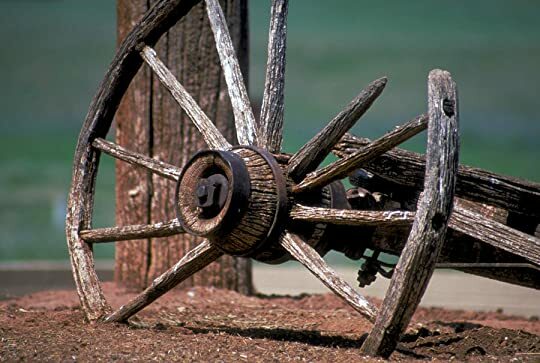 "Broken Wheel was a complete waste of brick, asphalt, and concrete. The buildings were low because there had never been any need for more than two stories. Nowadays, there wasn’t even the need for one. ... There was something sad about the town, as though generations of problems and disappointments had rubbed off onto its bricks and its roads." But soon Sara realizes the worth of the quirky inhabitants of Broken Wheel, and as she brings changes to the hearts and minds of Broken Wheel with a used bookstore that she starts up, they begin to change the introverted Sara as well. Parts of this novel were completely charming. I particularly loved the bookstore plot, with its discussions of books and how they affect our lives. New books always had the strongest aroma. Sara assumed the printing smells just lingered and somehow, logically, disappeared once a book had been opened, read, and leafed through. That was what she thought on a purely intellectual level anyway, but she didn’t quite believe it. She still believed that what she could smell were all the new adventures and reading experiences awaiting her. Sara's love for all types of literature really comes through, and will warm the heart of any book lover. Warning: Bivald spoils a few well-known books, so beware of unwanted spoilers. Other parts were trite; for example, the names and the comparisons between Broken Wheel and its rival town, Hope, were too obvious for me to really appreciate. The inhabitants of Broken Wheel are offbeat and enjoyable, but for the most part stock characters. I was a little disappointed when this novel took a turn and started focusing on a couple of romances. The main love story with Sara had its moments, but I wasn't really feeling it. I thought the secondary relationship, between a bisexual younger man and an older, repressed lady, was more interesting. In the end, it all plays out in a predictable but nevertheless heartwarming way. The writing is often insightful; the translator did a wonderful job with the English text. I completely forgot that I was reading a book that had originally been written in Swedish. I can't vouch for the accuracy of the translation itself, but the writing style was very smooth and fit well with the subject matter of the book. Content advisory: the sexual content is pretty mild, but I don't recommend this one for "clean reads only" readers. This book was absolute rubbish. 394 pages of stupid observations written in a clumsy and somewhat childish language combined with unbelievable characters. It does mention quite a few books that I would love to read, but since it also reveals the ending of most of these novels, the name-dropping just ended up annoying me. What an utter waste of time. There was a TV series in the early 1990's called "Northern Exposure", set in Cicely, Alaska, a small town so off the grid it almost didn't exist. The town was populated by oddballs and eccentrics who used the local bar as a gathering place. Long before Tivo and Netflix entered the picture, I tuned in each week to be a part of their crazy, funny world. This book is set in Broken Wheel, Iowa, another little town off the grid, populated with oddballs and eccentrics with no place else to go. Along co There was a TV series in the early 1990's called "Northern Exposure", set in Cicely, Alaska, a small town so off the grid it almost didn't exist. The town was populated by oddballs and eccentrics who used the local bar as a gathering place. Long before Tivo and Netflix entered the picture, I tuned in each week to be a part of their crazy, funny world. This book is set in Broken Wheel, Iowa, another little town off the grid, populated with oddballs and eccentrics with no place else to go. Along comes a Swedish tourist who wants to visit her penpal friend Amy, only to find she's just in time for her funeral. Sara is a young woman who has lived her life in books, and leaving Sweden is the most daring thing she's ever done. She moves into Amy's house, uses her thousands of books to open a bookshop, and gets involved in the lives of the townspeople, none of whom read. Chaos ensues. Of course anyone who loves books will love this one: Sara's attempts to get the perfect book in the hands of people who need them are touching and familiar, and their acceptance of her and their attempts to get her nose out of a book and into their lives are funny and real. I entered the pages of this book just like I waited patiently for "Northern Exposure" 25 years ago, I couldn't wait to get back into the world of Broken Wheel and the people I grew to love. I am always a pushover for books about books and this one certainly fit the bill! What was even better was that the books mentioned throughout the text were mostly all books we know and love. Harry Potter was in there and Mr Darcy and even Bridget Jones amongst many others. On the other hand I have a low quirkiness rating and this story was certainly quirky and full of odd characters. Luckily for me it managed to stay just the right side of quirk and never became just silly. I loved the book shop I am always a pushover for books about books and this one certainly fit the bill! What was even better was that the books mentioned throughout the text were mostly all books we know and love. Harry Potter was in there and Mr Darcy and even Bridget Jones amongst many others. On the other hand I have a low quirkiness rating and this story was certainly quirky and full of odd characters. Luckily for me it managed to stay just the right side of quirk and never became just silly. I loved the book shop to bits. Wouldn't we all like to have a sunshine yellow room full of every sort of book and two comfy old armchairs to sit in and read all day. Who needs customers? They would just get in the way of reading time. The Readers of Broken Wheel Recommends by Katarina Bivald is a 2016 Sourcebooks Landmark publication. What a wonderful feel good story!! If you love books about books, you will want to try this one. Amy, from Broken Wheel, Iowa and Sara, from Sweden, are pen pals who share a love of books. When Sara loses her bookstore job, she decides to take Amy up on her invitation to visit Broken Wheel if she ever got the chance. However, when Sara arrives, she is stunned to learn that Amy has died. But, the The Readers of Broken Wheel Recommends by Katarina Bivald is a 2016 Sourcebooks Landmark publication. However, when Sara arrives, she is stunned to learn that Amy has died. But, the town goes out of their way to make their only tourist’s stay in Broken Wheel comfortable and pleasant. Overwhelmed by the resident’s generosity, Sara works to pay it forward, and honor Amy and her love of books by opening a bookshop in Broken Wheel. The longer Sara stays, the more attached she becomes to the small little town that has all but dried up, and the residents love her just as much as she does them, giving them all a renewed sense of optimism and hope. Soon, they all begin to wish Sara could stay with them on a permanent basis. But, will she be able to extend her Visa? I love offbeat and quirky characters, unconventional love stories, and books that imbibe charm and wit, and add just a touch of whimsy to top it all off. But, as a book nerd, a book that features characters who love to read, who love to share good books with others, is always going to get top marks from me. So, it goes without saying, this book was simply delightful. It’s quirky, funny, sweet, touching! I enjoyed watching the town wake up, as if from a long slumber, and it was wonderful to feel Amy’s spirit moving through the town, as Sara finds an unexpected purpose for her life doing exactly what she loves most. If you love small towns, stories about friendship and books, this book has your name on it! Sara, a young woman from Sweden, arrives in a small town of Iowa, named Broken Wheel. The name of the town is as quirky as its people. She wants to meet Amy, an elderly lady, who has been her pen - pal for quite some time. When an unexpected event changes Sara's plans, she decides to stay in this strange town and share her deep love for books with the residents of Broken Wheel. She shows them that, perhaps, Literature has some solutions to their problems (no matter how big or small), while she s Sara, a young woman from Sweden, arrives in a small town of Iowa, named Broken Wheel. The name of the town is as quirky as its people. She wants to meet Amy, an elderly lady, who has been her pen - pal for quite some time. When an unexpected event changes Sara's plans, she decides to stay in this strange town and share her deep love for books with the residents of Broken Wheel. She shows them that, perhaps, Literature has some solutions to their problems (no matter how big or small), while she struggles to step away from her comfort zone, to find her own answers and discover herself. Today, in the age of social media and instant communication, letter writing has become antiquated and uncommon. Not that many years ago however it was the norm and many people had ‘pen-pals’, myself included. This novel is about two women, one young and living in Sweden, one not so young and living in a tiny town in the middle of Iowa cornfields. Bibliophiles both, they become acquainted through books and the love of reading is what makes their relationship work. When after years of sharing their Today, in the age of social media and instant communication, letter writing has become antiquated and uncommon. Not that many years ago however it was the norm and many people had ‘pen-pals’, myself included. When after years of sharing their books, their thoughts about books and their reflections on life, Sara, the young woman from Sweden is made redundant when the bookshop she works in closes down. Amy invites her to Iowa to stay with her and so the story begins. Broken Wheel, Iowa, is small and less than prosperous and there are many empty buildings on Main Street. Books have always been Sara’s friends and her love of books and reading cause her to want to share her passion. She decides that she will open a used bookshop with Amy’s many books. It will be her way of paying tribute to her late friend and also give back to the townspeople who were so generous to her. Her tourist visa will not allow her to ‘work’ in the U.S., but she does not want to profit financially from her endeavor. Her parents back in Sweden think her plans foolhardy and want her to return home. Sara, on the other hand, has no real wish to return to Sweden where her family think her ‘boring’ and she had few, if any, friends. The little over six hundred town residents have become apathetic to life and their town in particular. It was a sad, dying town where little happened and one in which the young people left at their earliest opportunity. Sara’s arrival adds a much needed ‘spark’ to the town’s morale and as a result the townsfolk embrace Sara. Also, Amy’s nephew Tom provides a reluctant, though honest love interest for Sara – though she is skeptical of his interest due to her uninteresting, bookish ways and her plain appearance. 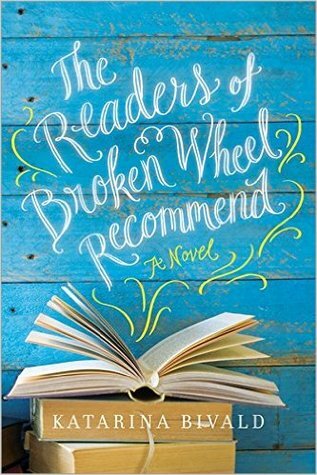 An uplifting, entertaining, and charming debut novel, “The Readers of Broken Wheel Recommend” has enough book references sprinkled into the narrative to please any bibliophile. Quirky characters, a community pulling together, and more than one love story ensure that this novel will be enjoyed by many. This review was originally published on https://fictionophile.wordpress.com/ as part of the offical blog tour of the book. This was such a cute story that moved my book-loving heart! Yes, it is very perfect and partly cheesy, but in this case I didn't mind because the novel was perfect that way. This story takes place in Broken Wheel, Iowa, and it contains a great love for books. Sara, the main character, is the sweetest girl whose love for books was so easy to relate to. She loves smelling them, looking at them, and of course devouring them over a cup of coffee or tea. This story also contains a diverse cast of char This was such a cute story that moved my book-loving heart! Yes, it is very perfect and partly cheesy, but in this case I didn't mind because the novel was perfect that way. This story also contains a diverse cast of characters which I quickly grew attached to. Once again, they are very caricatured - you have the crazy woman, the insecure Catholic and even a bisexual - but in this case it simply worked, and I didn't feel like rolling my eyes at any point. This is a sweet, charming story about what happens when a bookshop opens in a small Midwestern town. The story follows the bookish Sara, who travels from Sweden to Iowa to meet her elderly pen pal, Amy, only to learn that Amy has recently died. The townsfolk try to make Sara feel welcome, and soon she makes friends. Amy owned a lot of books, and Sara takes the initiative to open up a bookstore as a way to share the collection with the town. I'll pause here to say this is one of those cute, sweet b This is a sweet, charming story about what happens when a bookshop opens in a small Midwestern town. I thought perhaps this would be more like a Fannie Flagg novel (of which I adore), or maybe along the lines of a quirky Billie Letts novel, such as - The Honk and Holler Opening Soon. Or even something like The Guernsey Literary and Potato Peel Pie Society meets Steel Magnolias. Too dry, too dull, too crass, too skittish. And not very believable, either. Then again, the translation was wonky. Entire words were missing from standardized phrases. Maybe some warmth and c I thought perhaps this would be more like a Fannie Flagg novel (of which I adore), or maybe along the lines of a quirky Billie Letts novel, such as - The Honk and Holler Opening Soon. Or even something like The Guernsey Literary and Potato Peel Pie Society meets Steel Magnolias. Too dry, too dull, too crass, too skittish. And not very believable, either. Then again, the translation was wonky. Entire words were missing from standardized phrases. Maybe some warmth and charm was lost in the process. Irregardless, I simply couldn't make a go of this one. During the holiday season, I like to take a break from all the violent, suspense novels I usually read and will read a cozy novel or something along those lines. This book fit that criteria perfectly. Sara Lindqvist has been a pen pal to Amy Harris for a few years. What the two women have in common are books - both Amy and Sara read voraciously and love to talk about their books. Sara has been working in a bookstore in Haninge, Sweden where she lives and feels as if she is going nowhere and has never had a proper holiday or adventure. Amy, in her letters to Sara, writes stories about the people she has known in her life in Broken Wheel, Iowa. Amy invites Sara to come for a visit and when Sara loses her job due to the closure of her bookstore, Sara decides it is time for that adventure. Unfortunately a surprise awaits her on her arrival in Broken Wheel. This is a delightful read. Predictable, yes, but so what? In some of these troubling times, it's nice to read a book with quirky characters having a bit of a shake-up in their routine life that made this reader smile. When I was thinking about how to describe this book, the first word to mind was "sweet." But sometimes people see that word as synonymous with saccharine or syrupy. So maybe sweetly whimsical? Or maybe a sentence is better than a word or two: I think the reader for this book enjoys a gently rambling plot, quirky characters, romance, and above all, a passionate love of books. It was written by a Swedish author who at the time had never been to America. But from what I could Received from NetGalley. It was written by a Swedish author who at the time had never been to America. But from what I could tell after occasional short visits through my life, she got it spot on when she sends Sara, a lonely bookseller now out of a job, to Broken Wheel, Iowa, to visit her elderly pen friend Amy at the latter's invitation, only to discover when she gets there that Amy died. The dying town's few people all seem to agree that Sara must stay at Amy's house, which Sara isn't happy with. A bit at sea, Sara tries to figure out what to do with herself, as she meets the townspeople one at a time. When she discovers Amy's cache of books, she opens a bookstore/library. She can't actually earn a living, as her visa prevents it, but she can, and does, give away books to those she thinks might like them. Or lends them, if the reader brings a book back in order to get another. There are a lot of sharp observations about people, especially disappointed, hurt, or bewildered people. One of the best portraits is of the silently suffering George, the town drunk. One of the quirkiest is Grace, of a long line of gun-totin' Graces, as she will tell you, lengthily, whether you want to hear it or not. Grace, at one point, tells an investigating officer, Men just have no sense of anything romantic. Insist on wanting to get married and have you, rather than just hanging out with a little moonshine and some semiautomatic weapons. "The Readers of Broken Wheel Recommend" is a book built around books and the people who love them. It's about the power of books to build friendships, repair broken hearts, set dreams aloft, and change prejudices. It's a book that had so much promise, but for me ultimately fell short of the perfect "sweet spot" nice and cozy little story. Sara is a young Swedish woman who is pen pals with elderly Amy of Broken Wheel, Iowa -- a small down-of-it's luck town hit hard by the recession. Despite having "The Readers of Broken Wheel Recommend" is a book built around books and the people who love them. It's about the power of books to build friendships, repair broken hearts, set dreams aloft, and change prejudices. It's a book that had so much promise, but for me ultimately fell short of the perfect "sweet spot" nice and cozy little story. Sara is a young Swedish woman who is pen pals with elderly Amy of Broken Wheel, Iowa -- a small down-of-it's luck town hit hard by the recession. Despite having never met in person, they develop a solid friendship, and bond over a love of books. When the bookshop Sara works at closes, she decides the time is finally right to visit Amy in the USA. Unfortunately, she arrives in town at the exact moment Amy's funeral is taking place (not a spoiler -- this all takes place in the first chapter). The residents of Broken Wheel know all about Sara from Amy's letters, and embrace her arrival. They insist that she stay, if she wishes, and welcome her with open arms. Sara soon makes friends with those in town, but is dismayed to learn that Amy was the only one in town who enjoyed reading. Sara tries to remedy this situation by opening up a bookstore in one of the many shuttered storefronts in town, and stocking the store with Amy's voluminous collection of books. True to form, each of the side characters in the book fits a role you can probably guess -- recovering alcoholic, uptight Christian lady, town busybody, handsome single guy, etc. The book's whole premise relies on Sara feeling like she "belongs" in the town, and like it's "home"; the townspeople feeling like she belongs there; and a love story. Despite nearly 400 pages (which definitely felt like it was dragging at times), some of these connections just felt weak to me. I definitely wasn't getting "the feels" and so the book wasn't quite as satisfying as it could have been. The Readers Of Broken Wheel Recommend by Katarina Bivald is the charming story of friendship, small town romance and so much more. A story that connects two friends over their love of books. Sara Lindqvist travels from Sweden to meet and spend two months with her pen pal Amy Harris in Broken Wheel, Iowa. Upon her arrival Sara is shocked to learn of Amy's death and she has arrived just in time for the funeral. The townspeople insist that Sara fulfil her intended plans and stay at Amy's house as th The Readers Of Broken Wheel Recommend by Katarina Bivald is the charming story of friendship, small town romance and so much more. A story that connects two friends over their love of books. Sara Lindqvist travels from Sweden to meet and spend two months with her pen pal Amy Harris in Broken Wheel, Iowa. Upon her arrival Sara is shocked to learn of Amy's death and she has arrived just in time for the funeral. The townspeople insist that Sara fulfil her intended plans and stay at Amy's house as this is what Amy would have wanted. Sara reluctantly agrees. The people of Broken Wheel welcome Sara and in no time at all treat her as one of their own. In an effort to repay their kindness Sara decides to open a book store for the town. Her new friends help her while at the same time scheme on how they can get her to stay in Broken Wheel forever. The novel includes letters from Amy to Sara which show how Amy entices her friend to make the trip. A well written story with likeable and well-developed characters. Rating 5* out of 5. This is the best feel-good chick-lit book about books I've ever read. Deeply insightful in regards to the human condition, humorous and filled with books. I've snubbed this type of book for at least a year, I have no idea why, but I'm over that now. I know that a book of this quality is one in a hundred, but I seriously need some variation to my thriller-horror-zombie-blood-and-gore preference. Sara from Sweden is visting the truly godforsaken Iowa town Broken Wheels. She arri Rating 5* out of 5. This is the best feel-good chick-lit book about books I've ever read. Deeply insightful in regards to the human condition, humorous and filled with books. I've snubbed this type of book for at least a year, I have no idea why, but I'm over that now. I know that a book of this quality is one in a hundred, but I seriously need some variation to my thriller-horror-zombie-blood-and-gore preference. Sara from Sweden is visting the truly godforsaken Iowa town Broken Wheels. She arrives just in time for the funeral of the woman, Amy, that she was to meet for the first time. They had been exchanging letters and books for some time. The town people insist she stay at Amy's house and they welcome her into their midst, refusing to let her pay for anything. She feels that she needs to give something in return, so she opens a book store with Amy's books. When her visa is about to expire, the town will not let her go. The people in the town are wonderful characters. Sara with her nose stuck in a book reminds me a bit of Belle from "the Beauty and the Beast", except she is no beauty. She is neither pretty nor stylish, but with a kind heart. I had my doubts about this book when I started it since there were so many improbable events, but it ended being a cute light story. Sara, a bookseller from Sweden, has been a pen pal with Amy, an older woman and book lover from the tiny town of Broken Wheel, Iowa. When Sara loses her job, Amy invites her for a visit for two months. Sara arrives in Iowa to find that Amy had recently died, but Amy's friends want to entertain her for her vacation. To repay the people for their generosity, Sara vol I had my doubts about this book when I started it since there were so many improbable events, but it ended being a cute light story. Sara, a bookseller from Sweden, has been a pen pal with Amy, an older woman and book lover from the tiny town of Broken Wheel, Iowa. When Sara loses her job, Amy invites her for a visit for two months. Sara arrives in Iowa to find that Amy had recently died, but Amy's friends want to entertain her for her vacation. To repay the people for their generosity, Sara volunteers to open a small bookstore using the thousands of books that Amy had collected over the years. No. Just no. Not the book for me! Whatever would lead a European to vacation in Broken Wheel, Iowa, that “complete waste of brick, asphalt and concrete”? For Sara Lindqvist, the answer is books. Over the last two years she’s built up a friendship with Amy Harris of Broken Wheel through pen pal letters and exchanges of books. Now that the bookshop where she worked in Sweden has closed down, she has a bit of time and money to devote to a trip to America. “Reading books isn’t a bad way to live your life, but lately Sara had begun t Whatever would lead a European to vacation in Broken Wheel, Iowa, that “complete waste of brick, asphalt and concrete”? For Sara Lindqvist, the answer is books. Over the last two years she’s built up a friendship with Amy Harris of Broken Wheel through pen pal letters and exchanges of books. Now that the bookshop where she worked in Sweden has closed down, she has a bit of time and money to devote to a trip to America. “Reading books isn’t a bad way to live your life, but lately Sara had begun to wonder what kind of life it was, exactly.” She’s looking for a wider community, and certainly finds it in small-town USA. Although circumstances aren’t exactly as expected when she arrives in Iowa, she makes the best of it by opening Oak Tree Bookstore (as a labor of love, mind you; she can’t work on her visa). The whole town comes together to plan a wedding so Sara can earn residency, but will the ceremony convince the authorities – or is the emotion behind it such a sham after all? Given that she’d never visited the States at the time she wrote this novel (published in her native Sweden in 2013), Bivald has painted a remarkably accurate picture of a tiny Midwestern town peopled with fundamentalists, gays, rednecks and a gun-toting diner owner. She’s especially sensitive to the post-recession situation. It’s not all doom and gloom, though. Broken Wheel is locked in a rivalry with the neighboring town of Hope, and Sara makes it a personal mission to get Iowans reading. The kind of small-town charm you’d find in a Darien Gee or Jan Karon book is here in spades. I also appreciated how Sara helps people step outside their reading comfort zone: George, a middle-aged former alcoholic, delves into Bridget Jones and Shopaholic, while Caroline, a Christian busybody, tries a work of gay erotica. In all honesty, I was not too interested in Caroline’s romantic exploits or George’s family issues, but Bivald has done a decent job fleshing out all her secondary characters. Like The Storied Life of A.J. Fikry by Gabrielle Zevin, this is definitely chick lit, with a predictable Pride and Prejudice-esque romance at its heart, but I much prefer Bivald’s take. It’s warm-hearted and sweet, whereas Fikry was pure treacle. Maybe it’s the combination of bibliophilia and Scandinavian quirk that does it for me (and a dash of the epistolary never hurts). Sara has refreshingly Catholic taste: she treasures chick lit and thrillers – the good ones, anyway – alongside Austen and Candide. Although she still isn’t sure whether she prefers books or people, she believes she can find just the right book for anyone. My favorite incident is probably when the town watches in awe through the bookshop window as Sara spends a record 5 hours 37 minutes reading – she eats a sandwich with one hand and switches between books when she finishes one, but barely looks up. A cute read for book lovers, provided you can stomach a bit of chick lit / romance. I was delighted to win a free advanced copy through Goodreads First Reads. How many times would Sara hear that? She couldn't keep taking things for free and especially the rent. Sara came to Broken Wheel, Iowa, from Sweden to meet her pen pal, Amy, but what she found when she arrived wasn't what she was expecting. She didn't find Amy but a town of friendly folks who loved Amy and who loved giving Sara things for free. They also offered Amy's house to Sara since Amy was no longer in Broken Wheel. How many times would Sara hear that? She couldn't keep taking things for free ​and ​especially the rent. Sara came to Broken Wheel, Iowa, ​from Sweden ​to meet her pen pal, Amy, but what she found when she arrived wasn't what she was expecting. ​She didn't find Amy but a town of friendly folks who loved Amy and who loved giving Sara things for free. They also offered Amy's house to Sara since Amy was no longer in Broken Wheel. Sara was only there for two months on a visiting visa, but as she moved around the town and saw how there were so few stores and NO bookstore, she realized that Broken Wheel needed a bookstore. Sara was determined to make the town of Broken Wheel a town of readers. This book was a delightful read especially when books and authors I know were mentioned and love bloomed. THE READERS OF BROKEN WHEEL is a gem and a book that is perfect for a change of pace as well as a treasure for any book lover. I truly enjoyed the small town of Broken Wheel and its quirky, caring residents. The Readers of Broken Wheel Recommend is the first novel by Swedish author, Katarina Bivald. After some years of correspondence with Amy Harris, Sara Lindqvist, until recently employed at Josephsson’s Bokhandel, has come from Sweden for a vacation visit to Broken Wheel, Iowa. The first problem is that Amy has just died. The second is that, while she is staying in Amy’s guest room, no one will accept her rental payment. The third problem is that no one in Broken Wheel will let her pay for anythin The Readers of Broken Wheel Recommend is the first novel by Swedish author, Katarina Bivald. After some years of correspondence with Amy Harris, Sara Lindqvist, until recently employed at Josephsson’s Bokhandel, has come from Sweden for a vacation visit to Broken Wheel, Iowa. The first problem is that Amy has just died. The second is that, while she is staying in Amy’s guest room, no one will accept her rental payment. The third problem is that no one in Broken Wheel will let her pay for anything. And Sara can see that this run-down, dying town really can’t afford a free-loading tourist, nor does she want to be one. But Sara and Amy shared a love of books, so Sara gets an idea of something she can do for the town. It’s fairly obvious where this is going… With help from the townsfolk, Sara cleans up a dusty shop and turns it into a bookstore. People come from nearby towns, a bit of derision leads to some fun literary antics, and Sara has the town’s residents (and others) reading. Along the way, Sara meets, and gets to personally know, all those quirky folk that Amy wrote about. But Sara’s visa is going to run out, and the town soon cooks up a scheme to hold onto this tourist they would like to keep. Bivald’s charming debut novel is a tale about books and bookstores, but also about small towns and the special people that inhabit them, in this case from a Swedish perspective. There’s definitely a touch of Debbie Macomber here: while Bivald manages to include some unconventional pairings, this is a feel-good tale that will be especially enjoyed by booklovers and those who love happy endings. Flawlessly translated from Swedish by Alice Menzies, this one is likely to be Recommended by the Readers of Broken Wheel. Ovo je jako lijepa priča koja se lako i sa zanimanjem čita; jedna od onih kakve bi trebali češće čitati jer nas, makar na kratko vrijeme, udaljuju od svakodnevice i problema, a to nam, zasigurno svima ponekad treba. Ova knjiga posebno će zagrijati srca pasioniranim čitateljima jer će se prepoznati u mnogim citatima, razmišljanjima glavne junakinje; također će uživati i u atmosferi budući da se veliki dio radnje odvija upravi u knjižari. A cijela priča počinje tako što su se dvije ljubiteljice knjiga, sa različitih strana svijeta ( Sara, 28.god. iz Švedske i starija Amy iz Amerike) prepoznale i komuniciraju putem pisama o, naravno, knjigama. Sara prihvaća poziv prijateljice i putuje u mali, američki gradić Broken Wheel koji broji svega 637 stanovnika. Nažalost, tijekom Sarina putovanja, Amy premine te se ona nađe, na 3 mjeseca, sama u nepoznatom gradiću među stanovnicima totalno nenaviklim na turiste. Ipak, Sara ima tu prednost što ih poznaje preko Amynih pisama. A kroz knjigu i mi upoznajemo osebujne likove koji nastanjuju Broken Wheel i njihove životne priče. Neću vam prepričavati kako se Sara snašla u toj situaciji, samo ću pripomenuti da je vrlo brzo uvidjela da gradiću Broken Wheel, kao i njegovim (“slomljenim”) stanovnicima treba pomoć pa je napravila ono u čemu se najbolje snalazi- otvorila knjižaru. I tada se, malo po malo, uz Sarinu ljubav prema knjigama, uz ljubav žitelja gradića prema Sari i njezinoj knjižari , stvari počinju popravljati i, uz nezaobilazne, peripretije idu ka svome sretnom završetku. Para quem gosta de livros apenas o título da obra de Katarina Bivald e a capa fantástica vendem. Mas A Livraria dos Finais Felizes, não se fica apenas por estes pormenores, e ainda bem! Desde que o recebi, já há alguns meses, que me senti tentada a pegar nele. Mas gosto sempre de ter um bom livro (e tinha a certeza de que este era bom), por ler na minha estante, para aqueles momentos em que lemos alguns livros menos bons, ou então temos mais tempo disponível para o poder apreciar melhor. Com a c Para quem gosta de livros apenas o título da obra de Katarina Bivald e a capa fantástica vendem. Mas A Livraria dos Finais Felizes, não se fica apenas por estes pormenores, e ainda bem! Desde que o recebi, já há alguns meses, que me senti tentada a pegar nele. Mas gosto sempre de ter um bom livro (e tinha a certeza de que este era bom), por ler na minha estante, para aqueles momentos em que lemos alguns livros menos bons, ou então temos mais tempo disponível para o poder apreciar melhor. Com a chegada das férias a oportunidade deu-se e, poucas páginas lidas depois, já estava agarrada à história de Sara e à amizade que surgiu com Amy, uma mulher bem mais velha, mas cuja cumplicidade era muito grande. Sara leva uma vida bastante pacata na Suécia. É livreira e vive para os livros. No seu país, nunca fez grandes amizades, nem vida social. Mas o fecho da livraria, aliada à inusitada amizade com Amy, fez com que decidisse ir visitá-la a Broken Wheel, uma localidade pertencente ao estado do Iowa. A troca de correspondência entre ambas fez com que a amizade fortalecesse e Sara sentiu que já conhecia alguns dos poucos habitantes daquela cidade americana. Essa correspondência é partilhada com os leitores ao longo de todo o livro, o que me agradou bastante, para conhecer um pouco melhor da personalidade de Amy. No entanto, os habitantes e toda a envolvência da pequena localidade, apesar de quase desertificada, faz com que ali permaneça durante algum tempo, pelo menos até que o seu visto de turista termine. After losing her job as a bookseller, Swede Sara Lindqvist, makes the fateful decision to travel across the Atlantic to visit her American pen pal, Amy Harris. What she finds though on her arrival is much more than she bargained for. Firstly the romantic thoughts of relaxing and reading with her friend are put on hold after the shock news that Amy has recently passed away and secondly Broken Wheel is a shadow of it's former self. Sara is shocked by what she finds and is totally overwhelmed by the After losing her job as a bookseller, Swede Sara Lindqvist, makes the fateful decision to travel across the Atlantic to visit her American pen pal, Amy Harris. What she finds though on her arrival is much more than she bargained for. Firstly the romantic thoughts of relaxing and reading with her friend are put on hold after the shock news that Amy has recently passed away and secondly Broken Wheel is a shadow of it's former self. Sara is shocked by what she finds and is totally overwhelmed by the hospitality of the locals who not only allow her to stay in Amy's house, but also refuse to let her pay for anything. After a bit of thought Sara realises that the only way to give back is by opening a store and sharing Amy's books with the town. Although slow on the intake, when Broken Wheels civil pride is at stake after bad words from neighbouring town Hope, the resident's rally to the cause and bring out the best in everyone. One thing that's clear is that Sara's arrival has brought new life to Broken Wheel and when the immigration office threaten to take her away, little do they know this is a town that will not allow itself to fall apart again, as they come up with a clever and hilarious roost to ensure Sara stays for good. I kept putting this one off because the premise didn’t really grab me, but holy cats, I wish I hadn’t! This book about a young woman from Sweden who goes to Iowa to meet her bookish penpal (an old woman who we quickly learn has died) just sucked me right into its strange little world. Such a glorious, quaint, funny story. Probably will end up buying a print copy because I keep wanting to underline the beautiful little statements peppered throughout this one. from The Best Books W I kept putting this one off because the premise didn’t really grab me, but holy cats, I wish I hadn’t! This book about a young woman from Sweden who goes to Iowa to meet her bookish penpal (an old woman who we quickly learn has died) just sucked me right into its strange little world. Such a glorious, quaint, funny story. Probably will end up buying a print copy because I keep wanting to underline the beautiful little statements peppered throughout this one. Katarina Bivald grew up working part-time in a bookshop. Today she lives outside of Stockholm, Sweden, with her sister and as many bookshelves she can get by her. She'scurrently trying to persuade her sister that having a shelf for winter jackets and shoes is completely unneccessary. There should be enough space for a book shelf or two instead. Limited success so far. Apparantly, her sister is als Katarina Bivald grew up working part-time in a bookshop. Today she lives outside of Stockholm, Sweden, with her sister and as many bookshelves she can get by her. She'scurrently trying to persuade her sister that having a shelf for winter jackets and shoes is completely unneccessary. There should be enough space for a book shelf or two instead. Limited success so far. Apparantly, her sister is also stubbornly refusing to even discuss using the bath room to store books. Katarina Bivald sometimes claims that she still hasn't decided whether she prefer books or people but, as we all know, people are a non-starter. Even if you do like them, they're better in books. Only possible problem: reading a great book and having noone to recommend it to. Läsarna i Broken Wheel rekommenderar/The Readers in Broken Wheel Recommend is her first novel. "A complete knock-out in the feel-good genre"
"If you loved 'The Guernsey Literary and Potato Peel Pie Society' you’ll love this"
- Tara Magazine, “ The Best Books Right Now"
"I instantly compared it to 'Chocolat'"